5.4 Earthquake hits the Maug Islands in the North Mariana Islands. Two 5.3 Earthquakes his offshore Chiapas, Mexico. 5.0 Earthquake hits south go Fiji. Sri Lanka – The death toll from mudslides and floods in Sri Lanka has climbed past 200, with 96 others missing, the government said Wednesday. The Disaster Management Center said that 202 people were confirmed dead. More than 77,000 have been displaced and over 1,500 homes destroyed since rains began swamping the southern and western areas of the Indian Ocean island nation last Friday. Thailand – At least 29 spots in Bangkok experienced flash flooding following torrential rain across the capital on Tuesday morning, according to the Bangkok Metropolitan Administration’s (BMA) flood prevention centre. The highest rainfall was measured at 95.5 millimetres per hour in Bang Khen district, while the average flood water level went from 10 to 20 centimetres, the centre said. Forest fires raging through Siberia’s Trans-Baikal Region have more than doubled in one day from 1,200 hectares to 2,700 hectares, the regional Natural Resources and Ecology Department reported today. “On Monday morning, there were five blazes in the region scorching a total of 1,300 hectares, while four more blazes engulfing 288.5 hectares had been contained. In addition, two forest fires are raging on the Russian Defense Ministry’s territory of 40 hectares, and one fire covering 1,000 hectares has been contained. There is no danger to any communities,” the statement said. The main culprit for the fires, according to the regional department, is human activity, whereas they keep spreading because of a higher daytime temperature and powerful winds. A total of 447 people, including 160 paratroopers, and 78 military vehicles are engaged in the fire-fighting operations. The conflagration worsened in some Siberian regions last week. 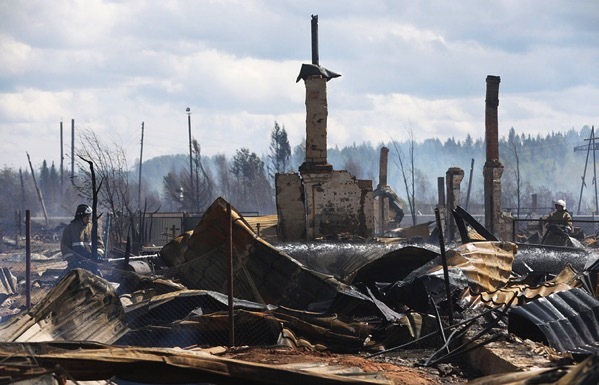 Blazes broke out in 10 communities in the Krasnoyarsk and Irkutsk Regions, consuming 179 buildings in their path that were home to 720 people, six economic facilities and 15 non-residential facilities. Three people lost their lives as the blazes tore through the Krasnoyarsk Region. The Trans-Baikal Region has been placed under a state of emergency restricting access to forests, or entering them in any vehicles. In a follow-up on the hepatitis E outbreak in southeastern Niger, officials with the United Nations Office for the Coordination of Humanitarian Affairs (OCHA) reports (computer translated) the case count has risen to 664 suspected and confirmed cases in the Diffa region. To date, at least 30 fatalities have been reported this year. In a follow-up on the large measles outbreak in Romania, the National Center for Surveillance and Control of Communicable Diseases (computer translated) puts the outbreak case count at 6,434 confirmed cases since last September. The number of measles-related fatalities are confirmed at 26, with a 27th possible death still being investigated in Dolj. A six-year-old child has died while forty people are recuperating at Marsabit County Referral Hospital after an outbreak of kala-azar. The hospital Chief Officer Abshiro Hapicha said that up to 20 people were also referred to Kenyatta National Hospital. He said, the outbreak began a month ago along the Garrisa-Marsabit border. 6.6 Earthquake hits Sulawesi, Indonesia. A strong, shallow earthquake rocked Indonesia’s central Sulawesi province Monday evening, injuring at least three people and damaging some buildings and houses. 5.7 Earthquake hits Bio-Bio, Chile. 5.7 Earthquake hits the South Sandwich Islands. 5.4 Earthquake hits southern Alaska. 5.4 Earthquake hits the Solomon Islands. 5.3 Earthquake hits southern Sumatra, Indonesia. 5.2 Earthquake hits the Santa Cruz Islands. 5.0 Earthquake hits the Ryukyu Islands off Japan. Three 5.0 Earthquakes hit Sulawesi, Indonesia. 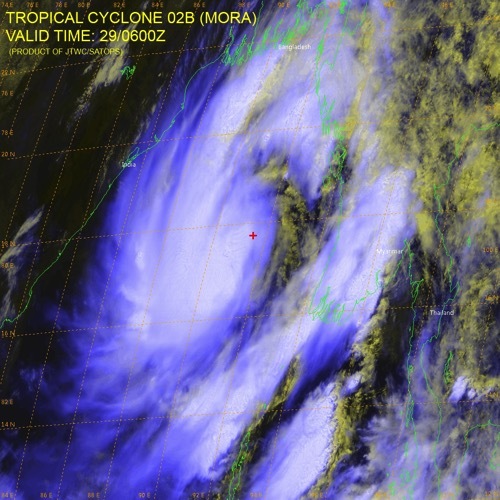 In the North Indian Ocean: Tropical cyclone (tc) 02b (Two), located approximately 38 nm north-northeast of Chittagong, Bangladesh, is tracking northward at 21 knots. Bangladesh – Cyclone Mora has battered Bangladesh, killing at least three people and wreaking havoc in camps housing Rohingya refugees. The tropical storm has forced almost 500,000 people to flee coastal villages. Packing heavy rain and winds, the storm made landfall between Cox’s Bazar and the port city of Chittagong early on Tuesday morning. Brazil – Heavy rains and flooding have driven tens of thousands of Brazilians from their homes in the country’s northeast and caused at least six deaths, authorities said Monday. The state of Pernambuco has declared a state of emergency in 14 cities affected by heavy rains in recent days. More than 40,000 people have fled their homes, some of which have been destroyed, as flood waters rose waist-high in some places. Two people have died, state officials said. In the neighboring state of Alagoas, more than 2,000 families have been forced from their homes and four people have died, authorities said. The Great Barrier Reef can no longer be saved in its present form partly because of the “extraordinary rapidity” of climate change, experts have conceded. Like coral across the world, the reef has been severely damaged by the warming of the oceans with up to 95 per cent of areas surveyed in 2016 found to have been bleached. 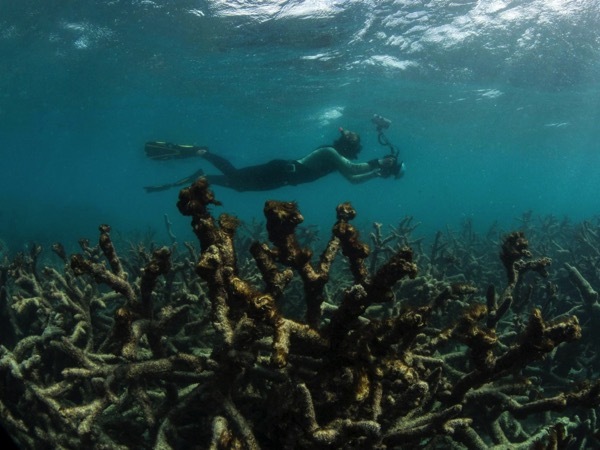 Bleaching is not always fatal but a study last year found the “largest die-off of corals ever recorded” with about 67 per cent of shallow water coral found dead in a survey of a 700km stretch. Now experts on a committee set up by the Australian government to improve the health of the reef have revealed that they believe the lesser target of maintaining its “ecological function” is more realistic. The concept of ‘maintaining ecological function’ refers to the balance of ecological processes necessary for the reef ecosystem as a whole to persist, but perhaps in a different form, noting the composition and structure may differ from what is currently seen today. There were 3.5 million Guinea worm disease cases in 21 countries in Africa and Asia in 1986. According to the Carter Center, 25 human cases of Guinea worm disease in three countries were reported in 2016. The first three months of 2017, only three cases have been reported, all from Chad. However, according to a World Health Organization (WHO) Weekly Outbreak Bulletin today, it is reported that there were 21 suspected cases of Guinea worm reported from Tonj East County, in Warrap State in northwest South Sudan. 5.0 Earthquake hits western Turkey. In the North Indian Ocean: Tropical cyclone (tc) 02b (Two), located approximately 277 nm south of Chittagong, Bangladesh, is tracking north-northeastward at 08 knots. Sri Lanka, Update – At least 126 people have been killed and nearly 500,000 displaced in Sri Lanka following flooding and mudslides triggered by monsoon rains, the government says. A further 97 people are still missing. Rescuers had set up 185 camps for displaced people and the town of Matara in the south of the island was being evacuated because of the risk of flooding. Earth’s already-beleaguered northern icecap suffered another blow this month with the early collapse of a barrier that kept some of Arctic’s most durable ice in place. The ice arch across the Nares Strait, which separates Greenland from Ellesmere Island in Canada’s far northeast, gave way two months earlier than usual, said Laurence Dyke, a paleoglaciologist at the Geological Survey of Denmark and Greenland. 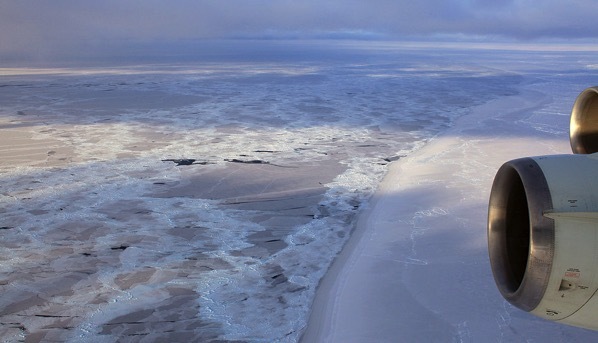 The channel and the Lincoln Sea, at the northern tip of Greenland, are normally covered by a sheet of ice several meters thick until around July, Dyke said. Usually, ice sheets that cover the strait are anchored to land and don’t move, blocking the passage of sea ice through the strait. But as heat-trapping fossil-fuel emissions like carbon dioxide build up in the atmosphere, the Arctic is warming twice as fast as the rest of the globe. And this year, land-anchored ice in the strait failed to form amid the record warmth and record low sea ice coverage recorded across the Arctic. That left only an arch of ice at the northern end of the strait, where it joined the Lincoln Sea — the structure that gave way earlier this month. “This is especially important as the Lincoln Sea contains the last bastion of old, thick multi-year sea ice,” Dyke said. 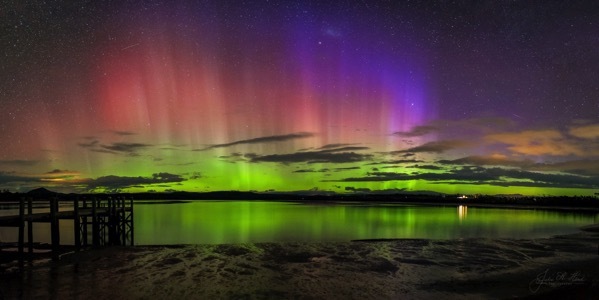 The southern-most points of Australia and New Zealand have been treated to an extraordinary spectacle as unusually colourful aurora australis lights swept across the skies. As torrential rains still pound different parts of Zanzibar, causing anxiety about the eruption of communicable diseases, the Ministry of Health and Social Welfare has said 23 people have been reported to be suffering from cholera. 5.2 Earthquake hits the Andreanof Islands in the Aleutian Islands. In the North Indian Ocean: Tropical cyclone (tc) 02b (Two), located approximately 457 nm south of Chittagong, Bangladesh, is tracking northeastward at 08 knots. Ivory Coast – At least seven people have died between Wednesday and Thursday following floods that have soaked the Ivorian capital Abidjan. Ivorian firefighters said on Friday that the deaths were mainly caused by collapsing walls following the heavy rains that pounded the capital. Arkansas, USA – The U.S. Department of Agriculture has declared 23 Arkansas counties disaster areas after recent flooding. Counties designated as disasters include Faulkner, Lonoke and Randolph.